I hope everyone has had a good start to 2018! In case you missed December’s Newsletter, one of our biggest updates from last year was that Dmitry Buterin, founder of Wild Apricot, decided to finish his time at Wild Apricot after 12 years. I encourage you to read the newsletter, because it also covers our key achievements from 2017. Going forward, I will be providing you with the monthly newsletter updates. My name is Evgeny Zaritovskiy and I’m the Product Manager here. I’ve been with Wild Apricot since day one and I work with our development team to provide you with the best membership management software possible. Many of you may already know me from our Wishlist Forum, under the “Apricot Kernel” nickname, where I give updates on our feature requests. With all that said, let’s get right into the updates for this month! Are there features in Wild Apricot you find difficult to use? We’ve received a lot of feedback about the difficulty of some features in our software, which is why one of our goals in 2018 is to simplify Wild Apricot — another way of saying this in more technical terms is that we aim to improve your User Experience (UX). To be clear, we do not have exact solutions for everything yet. Our designers will be looking into your feedback, preparing prototypes and testing them throughout the year. Some of these ideas won’t make it into 2018 updates, so 2019 is looking exciting for us as well. Simplification is nice, but not enough. That’s why we plan to continue delivering your top requests from the Wishlist forum. I’m quite excited to see all these features, and several more, released throughout 2018. Thank you to everyone who voted for them and provided comments — we always appreciate your input. If you’d like to browse the rest of our requested features and add your votes, please visit our Wishlist forum. At the end of May, the General Data Protection Regulation in the EU (GDPR in short) will come into effect, replacing the existing Data Protection regulations. The idea of this regulation is to protect and empower all EU citizens’ data privacy. While the majority of our customers are from North America, we do have a significant number from the EU. That’s why we are working to make Wild Apricot compliant with the GDPR. I will share a full update on this project in an upcoming newsletter to clarify questions, our status and next steps. For now, I just wanted to reassure you that Wild Apricot is taking the GDPR into account and is working on it. Over the next few weeks, Wild Apricot will be launching a new help site, featuring a new way to view help: within the product itself. If you prefer reading help articles in a larger window, you can click the icon beside the topic title to view the article full-sized on the external help site. All the content available from the inproduct help panel is also available from the new external help site, which can be directly accessed at gethelp.wildapricot.com. The old help site – help.wildapricot.com – will still be available while we switch all our internal and external links to the new site. If you’ve bookmarked any pages on the old site, they will still work, but eventually they will be redirected to the corresponding page on the new help site. We’ve reorganized the content on the new help site, reducing overlap and the need to jump between multiple topics to resolve a single issue. As well, we’ve added a new search engine that does a much better job of directing you to the right topic. It not only anticipates your question as you type, it also understands what you mean when you mistype your question. Here’s an example if you type in “youtube vidoes” (notice the misspelling and how the search bar auto-corrects it?). The inproduct help panel replaces the Help icon that appeared below the Wild Apricot logo in the upper right corner of admin view. 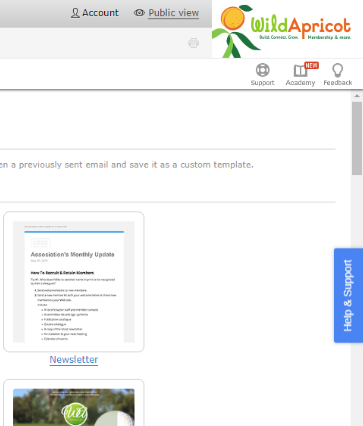 To display the help panel when it’s closed, click the Help & Support tab on the right side of admin view. To close the inproduct help panel, just click the X in the upper corner of the panel. 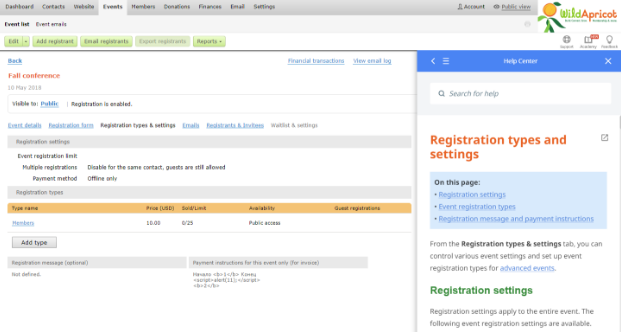 When you first open the inproduct help panel, it will suggest appropriate help topics based on your current location. If you’re unable to find an answer to your question, you can submit a support request from within the help panel. From the help panel menu – which you can display at any time by clicking the icon within the top of the help panel – simply click the Support request option and enter the details in the form that appears. As you enter the subject and details of your request, the search bar will automatically suggest related help topics that might be able to answer your request without waiting for a reply from our support department. The inproduct help panel will be rolled out as part of the upcoming 5.17 release of Wild Apricot. The new external help site is already live at gethelp.wildapricot.com, if you want to check it out. How are some membership managers able to get everything done and still have a life? The quick answer is that they use tech tools to do as much of their work as possible. In this webinar, our very own nonprofit tech expert Terry Ibele will show you 21 tech tools to save you hours and hours each week. Sign up now and we'll see you on January 30, at 2:00 PM (ET) / 11:00 AM (PT). Does your organization need to raise more funds? Member dues and fundraising aren’t the only ways nonprofits are earning their bread and butter. To find out how they’re doing it, and to start generating revenue in new ways yourself, take a look at our recent post on The 5 Best Ways to Generate Earned Income for Your Nonprofit. One thing I'd like to see - and have asked about too many times - is fix the page numbering system in your Help Manual. For some reason, the page numbers in the table of contents are only 3-digits long, but you have over 2,000 pages so any reference to pages above 999 are incorrect. I really like the thought of submitting help from within the Admin section of our web site. Good idea! Do we lose the telephone help line? I support an improved help manual. I always check there first. But my experience with your current email based help system has been disappointing. Your telephone helpers have always been excellent. Troy: you do not lose the telephone line. We're definitely keeping that! Paul: Thanks for bringing that up, I'll pass that feedback on to our support team. Thanks for working on simplifying WA. One thing we would like to see is the ability to develop a standards based single sign on system - this would allow us to integrate WA with other applications and our users would only need to sign in once. I think this is the single most important thing you can do immediately! I notice that it is the first item in your list of "Simplifications" and yet it is not even an objective for this year! It keeps getting mentioned but nothing happens! It is virtually impossible to create attractive, professional-looking pages currently unless you are fluent in HTML. I really would like to be able to pass on as much as possible of our documentation creation work as possible to others who know the content but who are not HTML-literate! Why can't WE make pages as nice as the ones YOU make! Ian: Thanks for the suggestion, feel free to vote on this in our Wishlist forum. Bob: You're right. It shouldn't be super complicated to make beautiful templates. I'm passing on your feedback to our development team. Perhaps you are trying to re-write your WYSIWYG HTML editor from scratch? Why not license code from someone that has already developed a competent editor and move on. This can't be a core competence for you guys, and not one you want to spend resources on developing. Focus on what you do best, buy the rest and get on with life. As an administrator, please make it less complicated for me to make a donation or membership payment by credit card on behalf of a contact (often without their email address which makes it super difficult). We regularly get mail-in credit card donation/membership requests and it's a royal pain and nearly impossible to enter these correctly -- even with the step by step instructions (that are confusing and nearly impossible to find or follow). This should take only moments to complete. Please simplify!!! Automated Nurturing Email Campaigns feature a bit like the event notifications but tailored to each membership levels or contact group. Think Mailchimp, Salesforce, Ontraport. This is one of the missing links thats hold you guys back from being a complete membership software. Also the suggested Online Store ASAP would be awesome!!! Hi Jeffrey, Victoria, Alistair - all great suggestions. I'm passing on to the team. Your feedback is always appreciated! I like the idea of simplification, especially for event managers, but it should not be confused with simplifying the functionality. Wishlist forum: the forum is an excellent way for all users to have the opportunity to shape the development of Wild Apricot. However, I have been frustrated on many occasions that sensible and obviously beneficial suggestions have become stuck because they are not significant enough to attract votes. 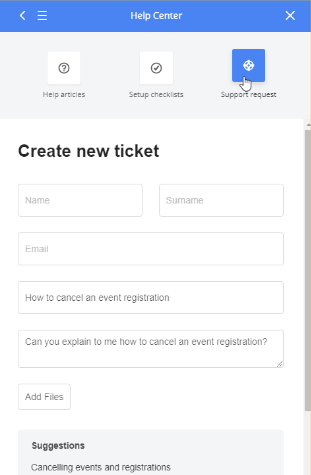 For example, when an event organizer receives email notification of a registration and hits reply, the email address that appears in the 'To' box is the event organizer's own email address. I cannot think of any situation in which this is helpful. It would be very helpful, I would imagine in 99% of cases, for the email address to be that of the person who registered for the event. For both these examples, I was instructed to put them on the Wishlist for voting but inevitably they have not progressed at all. Failing to act on such requests for change causes a lot of unnecessary frustration. Are there any future plans to enable the uploading of files to a member profile or event registration? One of our requirements for a particular event (application form) requires that the applicant provide supporting documents. Currently these documents must be emailed separately and it would so much easier if they could be attached to the initial application (registration for the event). In this day and age, the sales of intellectual property and digital assets is huge. I am really hoping this online store would integrate a member VS non-member buying system that I have seen in multiple other platforms. For example, it would be great if we can charge users in money OR member credits. Non-members could pay per item without commitment (like a traditional digital store), but members might receive 'member credits' with their membership (say 500 member credits per month, as designated by the site admins) that they can cash in for store items. This incentivizes long-term memberships for companies that use WA. It would be absolutely amazing to have that functionality.